What Is the Meaning of HER2-Positive Breast Cancer? 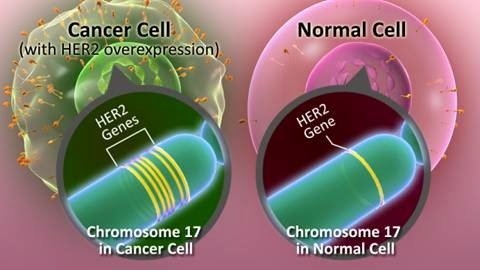 HER2-positive breast cancer is a breast cancer that tests positive for a protein called human epidermal growth factor receptor 2 (HER2), which promotes the growth of cancer cells. In about 1 of every 5 breast cancers, the cancer cells make an excess of HER2 due to a gene mutation. This gene mutation and the elevated levels of HER2 that it causes can occur in many types of cancer, not only breast cancer. This is a gene mutation that occurs only in the cancer cells and is not a type of mutation that you can inherit from a parent. Trastuzumab (Herceptin). Trastuzumab, which specifically targets HER2, kills these cancer cells and decreases the risk of recurrence. Trastuzumab is often used with chemotherapy. But it may also be used alone or in combination with hormone-blocking medications, such as an aromatase inhibitor or tamoxifen. Trastuzumab is usually well tolerated, but it does have some potential side effects, such as congestive heart failure and allergic reaction. Lapatinib (Tykerb). Like trastuzumab, lapatinib is a HER2-specific drug. Lapatinib may be effective for HER2-positive breast cancer that doesn't respond to trastuzumab. Lapatinib is used in combination with the chemotherapy drug capecitabine (Xeloda) and the aromatase inhibitor letrozole (Femara). Lapatinib is also being studied in combination with trastuzumab. Common side effects include rash, loose stools and the potential risk of congestive heart failure. Standard chemotherapy agents such as doxorubicin (Adriamycin) also can be effective in treating HER2-positive breast cancers, although these drugs don't specifically target the HER2 protein. Routine testing for HER2 is recommended for most women diagnosed with invasive breast cancer because the results may affect treatment recommendations and decisions. HER2 testing is not done routinely for ductal carcinoma in situ but may be performed as part of a clinical trial. Whenever breast cancer recurs or spreads, the cancer cells should be retested for HER2 as well as for hormone receptor status, as these can change from the original cancer in up to 20 to 30 percent of cases.